Do you ever start a project and have all the intentions in the world of taking pictures of every step and then get busy and don't take any!!!! Wow, what a dorf I am. 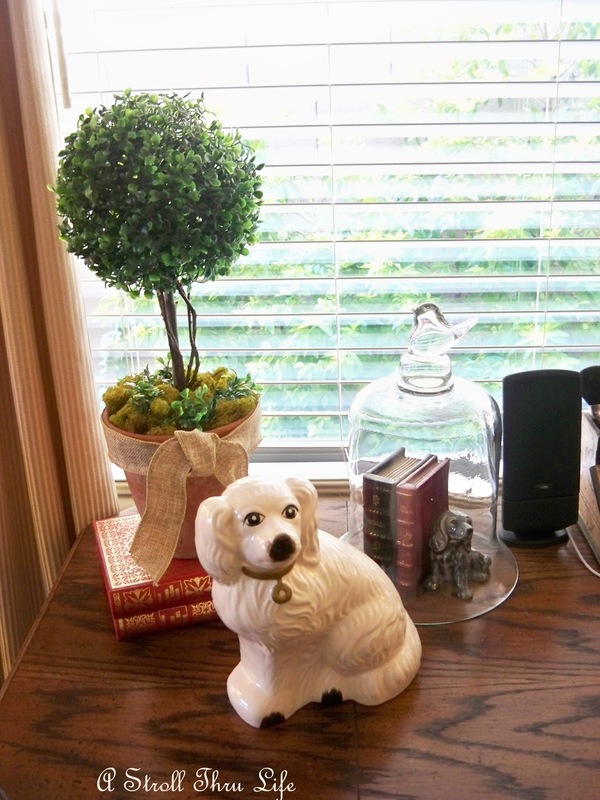 Anyway, when I was shopping at Hobby Lobby the other day with the girls, I saw so many wonderful boxwood topiaries and really would love to have a couple, but the price of $24 to $29 each stopped me. When I got home I thought I have a boxwood orb, so maybe I could just make one. I found a few twigs, got out the hot glue, wire, moss, a pot and some ribbon and went to town. See the mess, I really did mean to take pics, but I think this is really pretty simple. Actually, I don't think pictures are necessary. I cut a stem off a bush, and then some smaller ones to add to it, wired them all together, and stuck them in some foam in an old clay pot. Then I hot glued the boxwood orb to the sticks, placed some moss around the bottom, tied a little burlap ribbon and said done. I got the orb at Michaels on sale for $4, the rest was free, so this saved me a bunch. This all started because I wanted to fluff up my "office". That is a term I use really, really loosely. I don't have an office, I don't even have a desk, I use the buffet in the breakfast room as my desk and call that little space my office. Now this is not a pity party, this works just fine for me, and it allows me to be where everything is going on, near the familyroom and the kitchen. Small houses mean being creative. The surface is more than big enough to hold my keyboard, monitor, the Ipad, my desktop organizer and a few decorations. I am quite happy here. I think the new little topiary looks wonderful on the desk, stacked on a couple of books. Of course I love my wonderful Dog, and the cloche holds a couple of tiny books and another found dog figurine. Just enough to be fun and distract the eye away from the speakers. That little desk organizer that I found at GW last year is so handy, holds pens, paper, my brush to clean the keyboard, and the door opens to hold my camera. Everything within easy reach. I use the two drawers for other papers and things that I need, so actually, it makes a pretty good desk. Do you have a real office, or do you improvise too? I think you did a great job making your own topiary. It looks like you bought it that way! I agree, they can be expensive. I have some that I found at an antique store at a reasonable price. The preserved ones are more expensive though. That makes a nice accent on your desk. Love the topiary, Marty! I really like being creative, especially with things like that that are so expensive to buy! You have a great "office". I use a space in my upstairs family room. It's out of the way so I can make a mess, but still where the family likes to hang out. Most of us have to improvise! The topiary came out great.... I have a whole office and yet I find myself at the kitchen table instead... now how pitiful is that? I work from home a lot, so I have a desk but I don't have an office, the desk is in the living-room, because I have a tiny cottage. But it works fine for me. Love the topiary!! I made mine as well since they were a little pricey here. No Tabletop tues this wee??? Hello Marty, we are neighbors at Treasure Hunt Thursday. Popping over to say hello and say how great your home office looks. 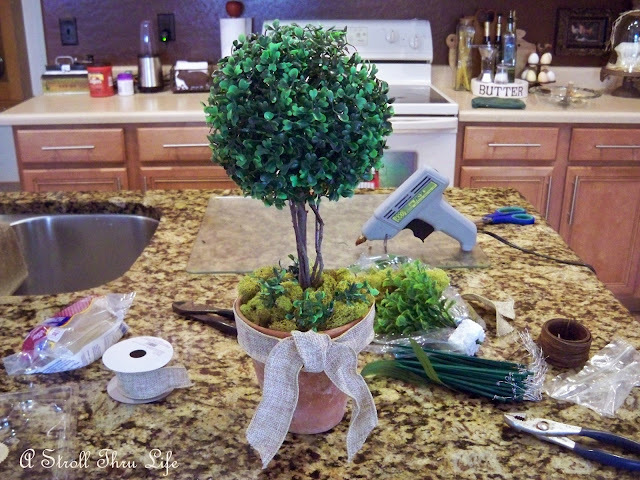 Nothing gets my attention like a topiary, especially a DIY that looks great. 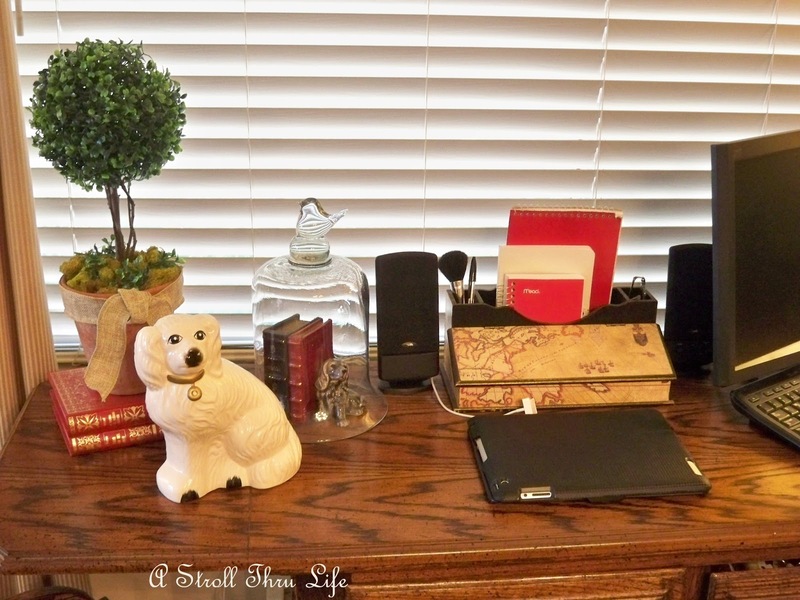 Your desk not only looks great but a great workspace! Marty, what a great workspace! You did a beautiful job on the topiary! I think it's perfect. I love it Marty- you did a great job on it. I like your "desk" area. I had a "game table" with my laptop in the living room for a long time. I enjoyed it there because it allowed me to be a part of everything going on. Now I use my iPad in the evenings to hang out in the living room and still have my internet access. It's not quite as good as using a computer but it's a good go-between! 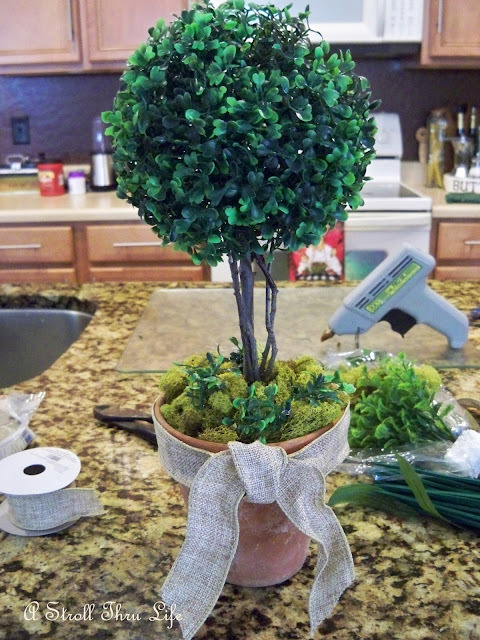 I have a topiary I want to dress up more. You've inspired my brain to work on it! Great topiary Marty, I love it!! I love how you've decorated your office area, Marty. Love the dogs and the punches of red in your decor. 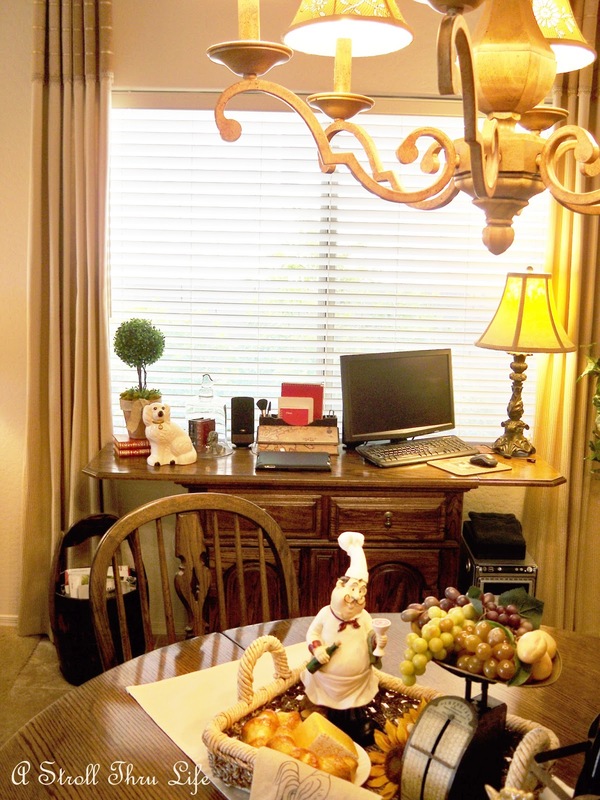 Small areas can work really well, and you show that off to perfection in your office! What a find Marty! I got my 2 boxwood topiary for $49 each at Homegoods!I've been robbed!But I'm happy with it, only now I know I can do better. Thanks! 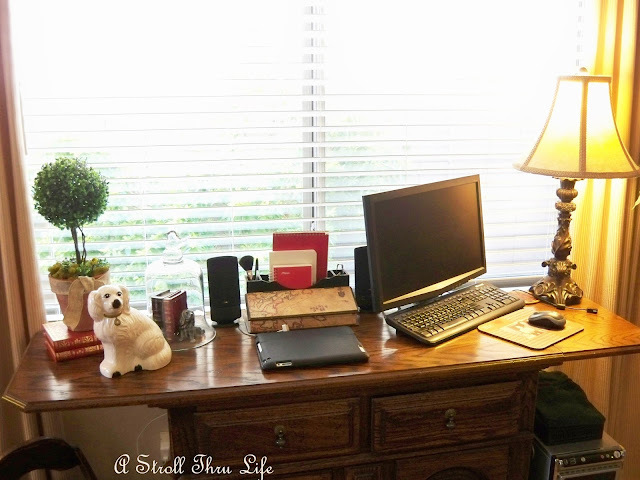 Don'tours have my own office, just blog and browse anywhere, wish I had one as cute as yours! I love your topiary! You're such a clever and crafty gal! So very clever, Marty! You make it look so easy and it looks great in your "office". My so called office is at the end of my couch. lol I have to be in the middle of everything too - I can't stand to close myself off from the rest of what's going on. This just shows that creative people can create anywhere, Marty. I have a whole bedroom to use, and I haven't "created" anything in a really long time. I'm so glad to see the way you're using your buffet. I'm filing that away for the future as we hope to downsize in the next few years. I have a very similar buffet that could work for me as well. Well that topiary looks as great as the expensive ones in the catalogs. Love it. Gorgeous Marty! Love your office!! I don't have a dedicated office space but I do have a desk that I never use! 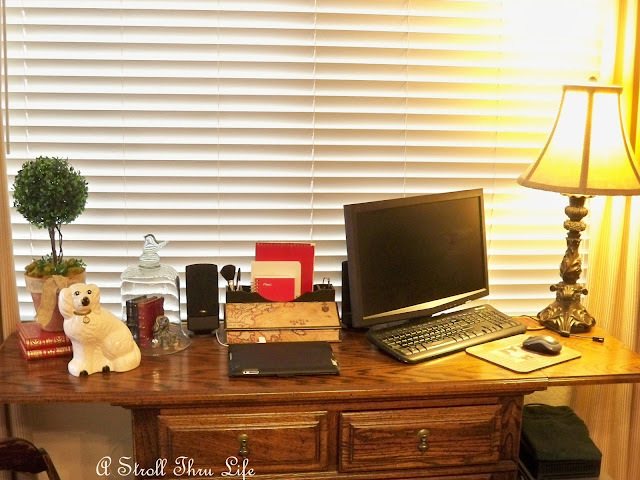 I have a real office, but I blog sitting on my love seat in the family room. The printer, fax, etc. are in the office, but I only work in there if I really need to. Love your topiary, and your desk area is just perfect. 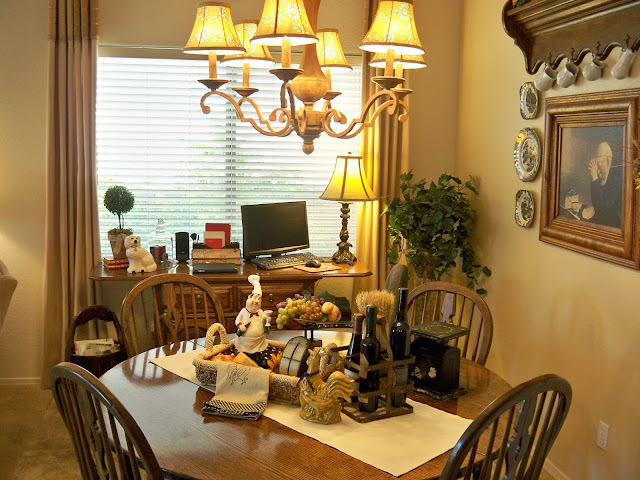 I use the buffet in the dinning room, too! LOL It used to be up stairs, but I wanted to be where the action is. Yours is much prettier though. Thanks for the great ideas for sprucing up my little space, too. My office is actually tied into the kitchen. When we built our house, we didn't want the kids closed up in a room away from our daily living space. 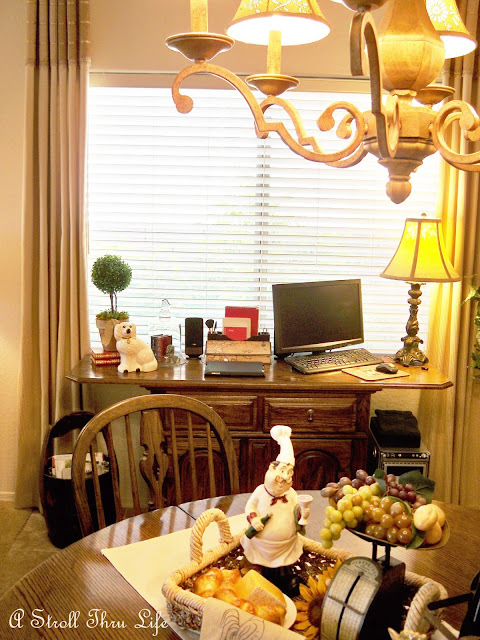 I am always looking for ways to spruce it up so thanks for the terrific ideas. I am your newest follower and looking forward to reading more of your blog entries. Please come and visit me at Still Woods Farmhouse! You make any area look beautiful with the way you decorate. I will be featuring it tonight at my Swing into Spring party that opens at 8pm EST. Please stop by and pick up an I've Been Featured button. Thanks. These office decoration ideas would be great for me, because I can use them to increase my office-space loveliness.